Gadigal land extends from Burrawar (South Head) across to Warrane (Sydney Cove) Gomora (Darling Harbour) conceivably to Blackwattle Creek, down to the Cook’s River and taking in the dunes and wetlands now known as Redfern. The Gadigal people carved images into the sandstone of this land for thousands of years. It is presumed that an outline was first sketched onto the rock, then a series of drill holes were made along the outline using a shell or stone and finally joined together by rubbing along the line with a pointed stone. This mural is to acknowledge and honour the Traditional Owners of this land, on which the Redfern Community Centre respectfully stands. Always was, always will be, Gadigal Land. Turn forward the clock and Gadigal Elder and artist Uncle Charles ‘Chicka’ Madden sketches an artwork inspired by Gadigal country, but instead of shell and stone, 3D computer generated technology create what has become recognised as the first public installation of Gadigal art on Gadigal land. 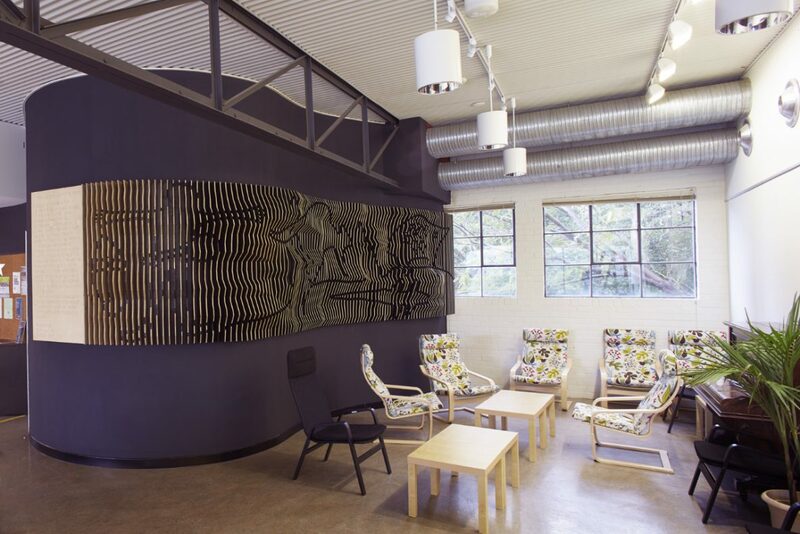 Mana ngurang (gathering place) is the fitting name for the 3D installation that adorns the walls of the Elders Lounge in the Redfern Community Centre, located in the heart of Sydney. The brief from the community was to create a painting that represented the story of Gadigal people on Gadigal land and incorporated the social wellbeing needs of the Elders Lounge. 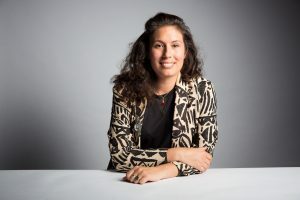 What evolved was a connection between cutting edge technology and Aboriginal philosophies of storytelling, sustainability, innovation, interconnectedness and collaboration; the vision of trans-disciplinary artist and Yamatji Wajarri woman Nicole Monks. Well known for her success as a collaborative artist and as founder of Aboriginal company Blackandwhite Creative, Nicole engaged Architect Dirk Anderson and Gadigal Elder and artist Uncle Chicka Madden to create the vision for the space. “The project began firstly by consulting the community; we asked them what story they would like to be told within the Elders lounge and from here developed the concept; rock engravings,” Nicole explained. Taking inspiration from the traditional Aboriginal carving techniques, the 1.5m tall by 9m wide installation wraps around the lounge walls creating a rock façade. 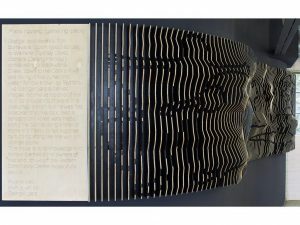 Working with Dirk Anderson, the rock wall panelling made of laser-cut plywood was developed and 3D mapped. The rock face was pulled from the walls and Uncle Chicka Madden’s artwork carved back into the rock to emulate the local Gadigal technique. “The most difficult design challenge was remaining sensitive to Gadigal culture while representing the rock carvings with cutting edge technology, “ Nicole said. Extensive consultation with community was undertaken throughout the design process ensuring cultural protocols were recognised and followed. “The contemporary nature of the installation combined with the artwork engaged a broad audience from young to old, Aboriginal and non-Aboriginal promoting social wellbeing and innovation while highlighting Aboriginal culture as ever evolving and diversifying,” Nicole said. Mana ngurang sees Aboriginal culture viewed in a modern context enabling knowledge transfer, conversation, interaction with culture and social wellbeing. The wellbeing category celebrates individuals, organisations and communities who use technology to produce wellbeing outcomes.